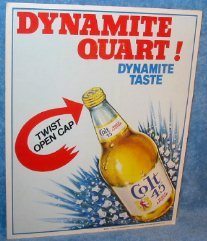 Colt 45 Malt Liquor; 11 x 14 inch, cardboard sign with an easel stand on the back. Sign is copyright 1980. Sign has soft corner points and a small bend in the lower right corner. Nice eye-appeal.